Ahoy - Mac's Web Log - Don Boyle R.I.P. Don had written a book on the little mine sweepers that did such sterling and hazardous work in WW2, he was awaiting its publication, but unfortunately did not live long enough to see the fruits of this labour. HMAS Goorangai, the first RAN ship to be sunk in WW2, she had been built in 1919, and was converted from a Fishing Trawler to a Mine Sweeper to serve in that capacity. Her mine sweeping officer was Don's Father, Reserve Lieutenant Commander Gordon Boyle. The 10,000 ton Troop Transport Duntroon loaded with troops was on her way down Port Phillip Bay, to clear the Heads and proceed to Sydney. At 8.27 PM on a very dirty night, the 20th. of November 1940, Duntroon ran down the tiny 223 ton Goorangai, chopping her in half, she sank in less than a minute taking her entire crew of 24 with her. Duntroon did not stop and only 7 bodies were ever recovered. Don Boyle aged only 4 had lost his Father. 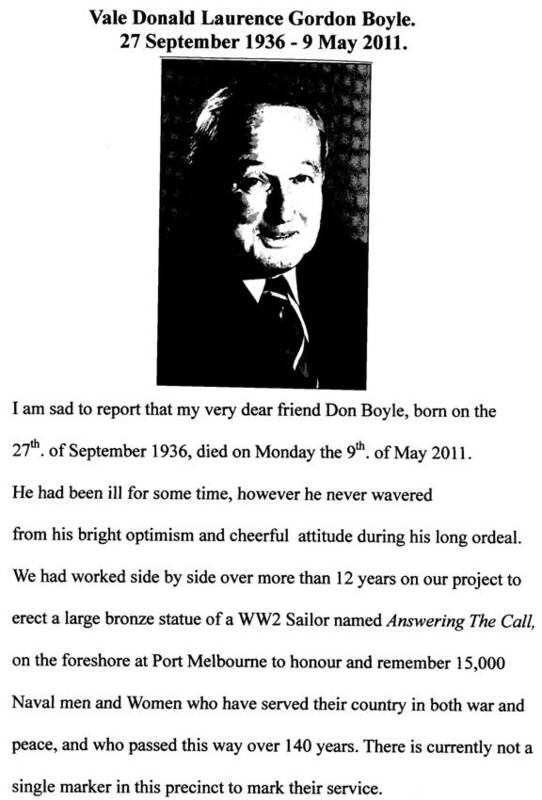 He was a Past President of this Chapter and I would like to propose that we institute a Don Boyle Oration dedicated to his memory. An annual address in May of each year on a suitable Naval subject would be delivered to the Victorian Chapter of the Naval Historical Society. I will deeply miss his friendship and our working together to achieve our dream... the finality of our Answering The Call project.